Bitossi covered bird dish in glazed ceramic by Aldo Londi. Multicolored leaf form piume "feathers" decorate the surface. 1950s Italy. Excellent condition. Measures: 9" wide, 7" in height. 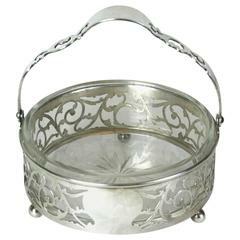 Sterling handled candy dish with glass liner. Pierced scrollwork gallery and handle with ball feet, 1950s, USA. Excellent condition. Pair of porcelain Fornasetti pebble paperweights. Motifs: Commedia dell'Arte by Piero Fornasetti Measures: 4" x 3" x 1.5". An Aldo Londi designed Gallina, [Hen] highly stylised and whimsical, this example in Kelly Green with red glazes. A scarce and collectable piece. An Aldo Londi designed Gallina, [Hen] highly stylized and whimsical, this example in Kelly Green with yellow glazes. A scarce and collectable piece. An Aldo Londi for Bitossi 'Cinese' [Chinese] glaze large horse head in blue. Made as a lamp base but never used as such, in lovely condition. A very large heavy vase in the shape of a flute playing man in blue with the Bitossi 'Liberty' pattern. This is a rare piece and has tremendous presence, in perfect condition. A large matte glaze finished goat or ram by Aldo Londi for Bitossi. Hard to find piece in top condition.